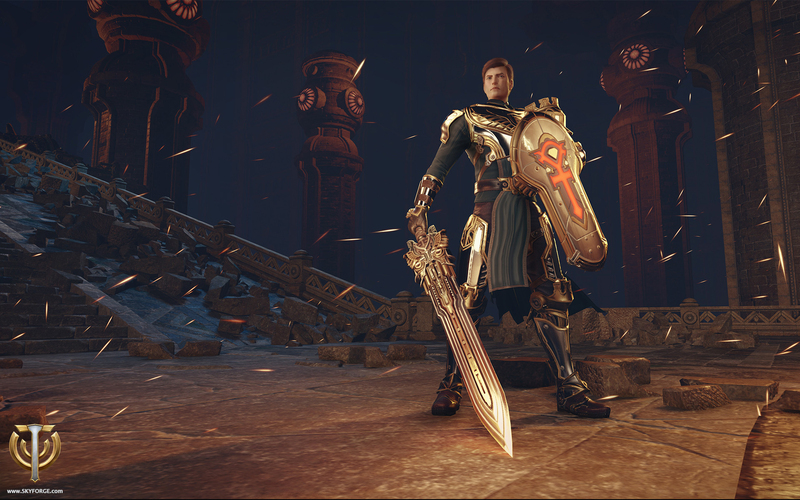 We would like to continue introducing you to the classes in Skyforge and today we will tell you about a fearless warrior and mighty defender of the oppressed- the Paladin! The Paladin prefers to fight at the forefront of a battle and he is not afraid to meet the enemy face-to-face. Paladins have a decent amount of health, allowing them to withstand the attack of any force and to "tank" several enemies at once, while fast regeneration means they are able to fight monsters non-stop, performing powerful attacks and spectacular combos as they move from enemy to enemy. Paladins can easily find allies for group adventures and their companions will find the Paladin to be a powerful and assiduous protector. He will defend allies with shields that reduce incoming damage, remove any weakening effects and keep the new effects from landing. First to engage in a fight, the brave warrior takes on most of the damage, drawing the enemies away from his less sturdy companions. As he performs basic attacks, he accumulates righteous anger which can be spent on more powerful techniques. Righteous Blow (LMB) - The Paladin attacks the enemy with a sword and inflicts minor damage. First strike in a series of basic attacks. Waves of Wrath (RMB) - This ability needs to be charged and can be activated by holding down the mouse button. The character swings his sword in a circle, hitting several enemies at once and knocking them off their feet. The weaker the opponent, the longer they will stay down. Seal of Light (LMB+RMB) - The Paladin swings his sword crosswise, inflicting moderate damage to the target and all enemies in the line behind it. Punishing Bolt (LMB+LMB+LMB) - The Paladin sword deals a powerful downward strike. On Holy Ground the target will be struck by lightning and the attack will inflict increased damage. Justice Blade (LMB+LMB+LMB+LMB) - After Righteous Blow, the Paladin does three quick strikes with the sword, each dealing more damage than the previous one. Divine Scourge (LMB+LMB+LMB+RMB) - On the fourth hit, the character jumps in the air and deals a downward blow, accompanied by lightning that strikes several targets. If the paladin is affected by Celestial Shield (one of the defensive skills), the shield explodes, inflicting additional damage. On Holy Ground or when righteous anger is used, the radius and the force of the attack increase. Holy Ground - The Paladin sanctifies the ground around him and gains inexhaustible power. While Holy Ground is active, character skills do not consume righteous anger even outside its borders. Aegis of Light - The character raises his shield in the air. A bright beam of light strikes it, making the character invulnerable and immune to control effects for some time. Radiant Aspect (special ability) - The Paladin calls upon divine power, rising into the skies and shaking off all negative effects. A moment later, he strikes nearby enemies, knocking them down and inflicting massive damage. The character becomes temporarily immune to control effects, his attacks inflict increased damage and all incoming damage is reduced. Once the attack is activated, Holy Ground appears next to the Paladin. We have listed just a few of Paladin's abilities. In the future you will find a detailed list and description of all Paladin abilities in a special section on our website. The main feature of this class is a large number of defensive skills that include the removal of negative effects and resistance to control. The Paladin's abilities do not end there: some of them massively increase damage; others make monsters focus on him. He can also control his enemies, stun them and knock them down, slow down and even immobilize them. 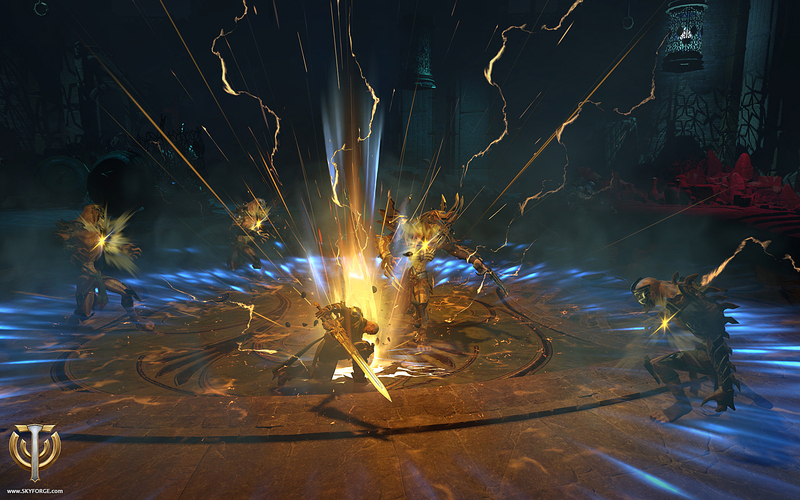 Unlocked talents will multiply your damage, restore health and increase your movement speed. All of these abilities can be used to create various combinations that will best suit your style of play. But bare in mind that the potential of the "tank" class should be tested out in group play. A good combination of passive and active skills will help heroes and their allies emerge victorious from the most dangerous fights. The Paladin is one of the most durable and hardy classes in the game. Temporary invincibility will help him escape from seemingly hopeless situations and turn the tide of battle. When things go really badly, the hero sanctifies the ground around him and gains the ability to use any skill without spending "righteous anger." For continuous DPS, a Paladin must be near his target. He can either draw the fleeing enemy to himself or dash towards them knocking them down. The attacks of this class are not the strongest, but they are not the Paladin's only weapon. His primary task is to draw enemies' attention to himself and let his teammates or his high survivability do the rest. The Paladin will be picked by those who want be at the forefront, in the midst of battle, and not hiding behind someone's back. Who will rush into the thick of battle, shielding his allies, and take the first hit. Players that choose the Paladin often become the leaders of the group, because it is usually up to them to decide when and how how they are going to lead their allies to victory! For your chance to try out the Paladin sign up for the beta now!